The Argyll Bird Club is a registered charity with membership open to all. 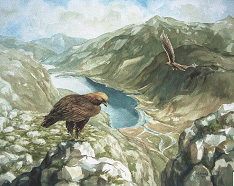 The club aims to promote an interest in birds in Argyll. We are a friendly club for anybody interested in wild birds, living in, or visiting, Argyll, irrespective of their level of knowledge, experience or skill. Visitors are more than welcome to our two annual indoor meetings which are all-day events held on a Saturday in spring and autumn (see News for details of upcoming meetings and trips). We also arrange monthly field excursions and anyone interested is very welcome to join us on one of these. For details see Activities pages. Argyll is not particularly big, but offers many superb birdwatching opportunities in habitats ranging from tiny offshore skerries, islands with sweeping sandy bays backed by machair grassland, fertile lowland glens, fantastically rich ancient woodlands, extensive conifer plantations, freshwater lochs, great tracts of moorland and peatland as well as dramatic mountains. The club arranges regular field trips to sites around Argyll where we can birdwatch as a group. Club telescopes are normally available to share. The most recent bird sightings can been found in the Recent Reports section of this website, which we hope will encourage you to visit this fascinating part of Scotland. 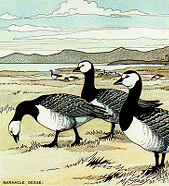 The Bird Club has published “Birds of Argyll” and produces Bird Reports on a regular basis. We also produce a quarterly newsletter “The Eider“. Back numbers of the newsletter can be downloaded from the Publications pages. These normally contain a review of recent bird sightings as well as articles of general interest and current club news. The Argyll Bird Club is grateful to Margaret Staley for allowing her paintings to be used, and acknowledges grants from Argyll & Bute Local Biodiversity Partnership and Scottish Natural Heritage.